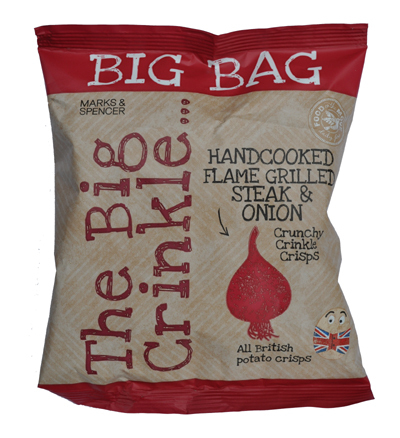 Marks & Spencer's 'The Big Crinkle' range had the same sort of design dynamics as the Hand Cooked range. Although this design has a light brown background with retro imagery and descriptive drawings to go with the flavour colour coding. We liked the 'All British' potato man in the corner. The wording is however all over the place, and eyes were drawn to the wrong areas of the bag at the wrong time. These crunched like a thin biscuit as much as a thick Crisp. The initial three or four bites were rigid and firm, but this diminished fairly quickly into a mushy swallow full. These were thickly sliced Ridged Crisps, that featured a healthy dose of dark coloured seasoning mixed in with the not so healthy looking oily glaze. There were some whole Crisps, but many were broken into splinters. Flame Grilled Steak sound a little specific. The food scientists must have spent an age differentiating between normal steak flavour and 'flame grilled' steak. Actually, no, they didn't. It is a glamorous sounding positioning description. They did taste a bit beefy, maybe even slightly spicy. They were actually quite enjoyable. But they tasted absolutely nothing like the description on the bag.